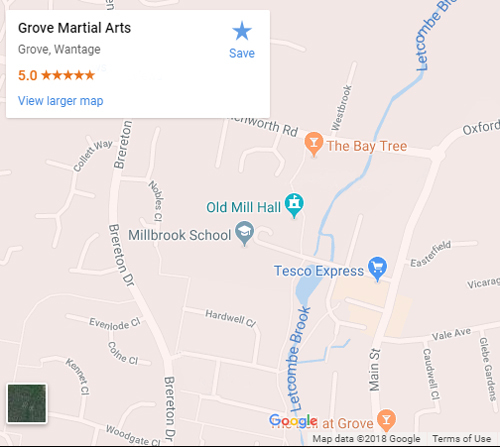 Grove Martial Arts was established in January 2008 in order to provide reality-based self-defence training specifically for the UK environment. We train in the traditional Okinawan karate system of Goju Ryu, and we teach this as the all-encompassing system it was originally designed to be. We do not train for sport or competition as we feel this is fundamentally incompatible with self defence training. Grove Martial Arts covers all aspects of self-protection, including but not limited to: UK self-defence law, fence concepts, pre-emptive striking, ground skills and psychology of violence. All skills are pressure-tested and scenario-proven. Training is progressive and tailored to the individual regardless of age, body type or gender. We believe you will find our training accessible, relevant to you and above all enjoyable! GMA Juniors offers a foundation in karate for 4-12 year olds. We provide a progressive program of development which includes: awareness, confidence building, non-physical conflict resolution and physical self-defence skills, all appropriate to the threats our junior students may encounter. As a non-profit group we use all the funds to improve the club for our members. This means we can offer opportunities which would not be possible in other organisations. We run annual residential training courses, host and attend seminars with world class instructors, and provide a wide range of the highest quality training equipment. "I have been going to this club for a year now, and I think it's fantastic. Everyone is friendly and the Sensei's are very approachable. It's great fitness and I don't even feel like I'm working out, until the next day.........! Passionate and dedicated about Goju Ryu Karate, they live and breathe it - they inspire me each and every time I go!" What is your reason for wanting to begin or return to training? What time can you realistically commit to your training? What training have you done before? This helps us best serve your needs, if the training we offer isn't right for you we have links with other local groups who may be able to offer what you’re looking for. We offer one month of free training - this allows us to assess your suitability for our training, and for you to decide if we are right for you. Grove Martial Arts is run by its members, with everyone having a voice. Training is hard but progressive and tailored to the individual. We strive to develop our students at a pace that is manageable but challenging. Being part of Grove Martial Arts opens many doors into the exciting world of pragmatic martial arts; there are many opportunities to get involved with the various club activities outside of normal training time. We are very aware of the pressures of work and family life on our students and as such there is no pressure to take part in these extra training opportunities. We know it can be daunting to take that first step through the Dojo door - so we've collated a selection of common questions asked by new students. If you can't find the answers to your questions please email or call us - we're always keen to hear from new potential members, we'll answer any questions you may have! Q: What can I expect from my first month training? A: Your first month will consist of working one-to-one or in a small group with one of our instructors who will take you through some basic techniques and core principles of Goju Ryu Karate. Safety comes first and we will ensure that you are completely comfortable and enjoying what you're doing. A: Any loose clothing that you can comfortably wear for physical activity; we also train barefoot. Once you become a member you will be given a Karate Gi (uniform) and white belt. Q: What safety equipment is provided? A: For your first few months of training the club will provide all the safety equipment you will need. Eventually you will be required to buy your own items of personal protective equipment which includes a groin guard, gum shield and gloves; females also require a chest protector. These items are available through the club at trade price. Q: What equipment do I need to provide myself? A: You aren’t required to provide any training equipment but it is recommended that you bring a bottle of drinking water to every session. A: Our training is full contact and so we would be lying if we told you training doesn’t sometimes hurt! Don’t worry, training is progressive and we take every precaution to ensure your safety and avoid injuries. Q: Is there a contract to sign or a minimum commitment? A: No – you will stay because you want too. There is a joining fee which is payable after a month of training with us, this covers the cost of your insurance, student record book, Gi (Karate uniform), belt and club badge which is awarded after 12 months training. Q: How do I pay for my training? A: Your first month is free. Once you become a member your monthly training fee is payable via standing order. You remain completely in control of your payments and may cancel at any time without incurring a charge. We take adult students from the age of 13 and junior students from the age of 4. Our junior members train in a separate class. You are welcome to view one or a number of sessions before taking part in your first training session. Students pay for their position within the club and may train at any of the sessions for £40 per month for adults, £30 per month for juniors, which is payable via standing order. We appreciate the impact the current financial climate has had on everyone. We strive to keep costs to a minimum while still maintaining a high standard of training and offering exciting opportunities. Being a non-profit making club means that neither the Instructors nor students rely financially on the club for their income and there is no requirement to "sell" a product. This allows us to offer competitive training fees and equipment at trade prices. It also means that every paying student is directly investing in their own training and their club.